Inverted-Bow Warships Back in the Aegean Sea ? Navy Recognition is pleased to welcome guest writer D-Mitch, operations research analyst and creator of the famous navalanalyses.com (if you don't know his blog yet, you should definitely check it out as it really is top quality!). D-Mitch looks at the potential return of "inverted bow warships" in the Aegean sea as the Hellenic Navy is reportedly looking closely at the Belh@arra frigate by French shipbuilder Naval Group. He also gives us his take on the design and features of this next generation frigate. Today, the Greek Navy (Hellenic Navy) is one of those Navies that maintain a significant amount of firepower thanks to the numerous fleet of surface combatants and submarines in its inventory. However, of the top seven most powerful Navies in the European Union, there is only one Navy today that has no anti-aircraft warfare (AAW) frigates or destroyers in its inventory; this is the Hellenic Navy. The Hellenic Navy has a large amount of frigates (13), submarines (11) and fast attack missile boats (17) but has not a single frigate equipped with a long-range anti-aircraft missile to protect the Fleet. It has been more than a decade since the decommissioning of the last of the four C.F. Adams destroyers, Kimon, obsolete AAW warships armed with SM-1 launcher. The WWI era Georgios Averof armored cruiser of the Hellenic Navy featured an inverted bow. It is now a museum ship. Hellenic Navy picture. It has been more than a decade since the decommissioning of the last of the four C.F. Adams destroyers, Kimon (pictured here), obsolete AAW warships armed with SM-1 launcher. Hellenic Navy picture. Despite the ongoing economic crisis, that hits hard the country, and despite the spending cuts including a high proportion of the defence budget, the situation is bound to change in the near future. Greek daily newspaper Kathimerini reported in January that the Greek government that entered talks with France regarding the procurement of two FREMM frigates. However, according to the reports that followed up the next days, Greece is negotiating with France to acquire the latest French frigate, the Belh@rra, a new stealth front-line digital frigate designed by Naval Group! Naval Group has named its new frigate Belh@rra in reference to Europe’s only giant wave: the Belh@rra. The first “a” transformed into an @ makes reference to the highly digital nature of the frigate proposed by Naval Group.In the frame of the FTI (intermediate-size frigate) programme conducted by the French Procurement Agency (DGA) on behalf of the French Navy, Belh@rra frigate is already selected by the French Navy (Marine Nationale). Specifically five such ships will join the French Navy by 2030. According to the latest news, French officials (including representatives from Naval Group) met with the Greek defense procurement agency on January 17 and with the Armed Forces Chief of Staff and the Chief of the Hellenic Navy on January 18. They discussed about a flexible financing plan for 2+2 vessels. Funding could come from the earnings on Greek bonds that France bought in the previous years and has not yet returned to Greece. 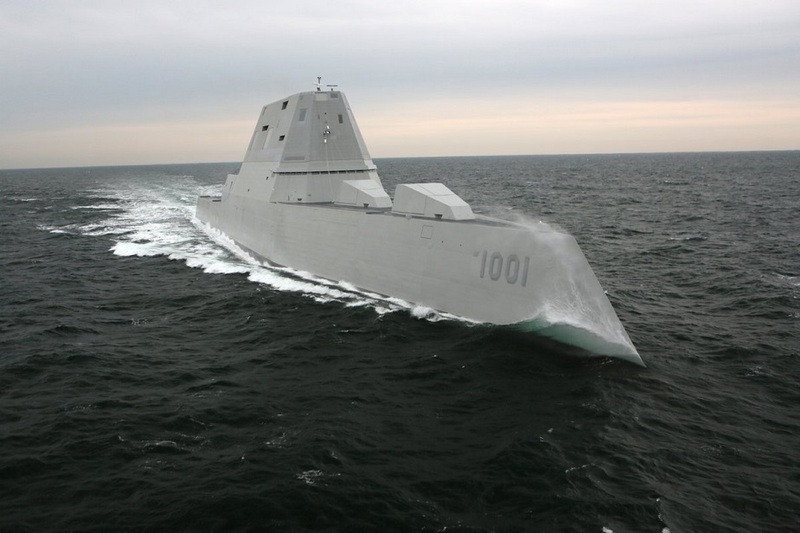 There is only one warship class today with inverted bow that is about to enter service: the Zumwalt-class stealth guided missile destroyer. US Navy picture. As mentioned earlier, Greece, in contrast to France, has an immediate need to acquire AAW ships. If we assume that Greece is negotiating to acquire frigates only from France, in comparison with FREMM, Belh@rra seems the ideal candidate to replace old Kortenaer class frigates. FREMM (Aquitaine class) has the size of a large frigate or even destroyer while Belh@rra is a bit larger than Hydras but require much less crew. FREMM’s role is mainly antisubmarine warfare (ASW) while Belh@rra can perform a variety of role, being equipped with all the weapons a FREMM can carry. Both designs have/or can be armed with four 8-cell VLS modules for +30km-range Aster 15 and 120km-range-Aster 30 surface-to-air missiles (SAM) as well as SCALP Naval cruise missiles. Both ships have eight anti-ship missiles, one medium gun, two RWS, torpedo launchers and decoy launchers. The only system is “missing” from Bel@arrasin comparison with FREMM is the two torpedo-defense systems; yet the Lacroix Defense Sylena Mk2 launchers that equip the Belh@rras can launch CANTO anti-torpedo decoys. Belh@rra though is fitted in its baseline configuration with the new digital Thales Sea Fire fixed-panels active electronically scanned array (AESA) radar when FREMM is fitted with the Thales Herakles MF radar. The Belh@arra during its launch at Euronaval 2016, seen here fitted with a RAM launcher by Raytheon on top of the helicopter hangar. Belh@rra scale model on Naval Group stand at PACIFIC 2017 seen here fitted with the new CAPTAS-4 CI (compact, independent tow) by Thales. According to an article published in mid-March in “Ta Nea” (The News) newspaper, the Greek government is moving towards the procurement of four (2 + option for another 2) Belharra frigates. The recent deterioration in the relations with Turkey (first the ramming of a Hellenic Coast Guard ship by a Turkish Coast Guard one, then the arrest 10 days ago of two Greek military at the land borders in the Evros region, as well as the increase of the violations of the Greek air and maritime borders and the new threats declared by Turkish politicians for military action against Greece) has sped up the process of the negotiations with the French side. According to the newspaper, the cost for the procurement of the two frigates will be slightly more than EUR2 billion and the payment will be made by the earnings that European Central banks made from the Greek bonds (France owes EUR1.5 bil., Germany another EUR3 billion etc). However, as the newspaper mentions, one of the biggest problems is the fact that the new frigates cannot be inducted into service before 2021. So in order to cover this operational gap, the two sides are allegedly discussing the possible lease of two FREMM frigates. The article also mentions that probably after Easter, the two sides will have agreed upon the technical characteristics and equipment of the ships. It also says that the countries aim for a strategic cooperation, under a European defence umbrella.